Saint Peter was the brother of Saints Basil the Great and Gregory of Nyssa, making him a member of a very illustrious family, and the youngest of ten children who were born to Saints Basil and Emmelia. He was born in 340 in Caesarea of Cappadocia. Saint Macrina, his eldest sister, exercised a great influence over his religious training, acting as his instructor and directing him toward the spiritual and ascetic life. Renouncing the study of the profane sciences, he devoted himself to the study of Holy Scripture and the cultivation of the spiritual life. Shortly after Basil's elevation as Bishop of Caesarea in 370, Peter received from him priestly ordination. Basil appears to have employed his brother as his confidential agent in some matters. Subsequently, he withdrew from active affairs, and resumed the life of a solitary ascetic. He assisted his sister and his mother in establishing their monastic community after his father's death. Peter became involved in the gradual transformation of his mother's household from a community of virgins to a cenobitic community of both women and men. He headed the male monastery while Macrina was responsible for the female community. When the provinces of Pontus and Cappadocia were visited by a severe famine, he gave a remarkable proof of his charity, liberally disposing of all that belonged to his monastery, and whatever he could raise, to supply with necessaries the numerous crowds that daily resorted to him, in that time of distress. 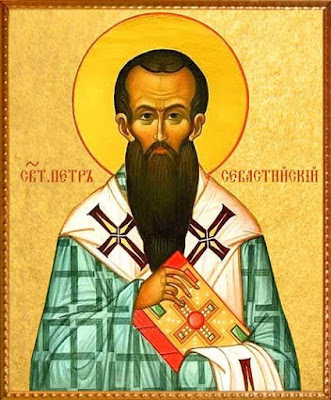 About 380 he was elevated to Bishop of Sebaste in Armenia after the death of the violent Arian and furious persecutor of his brother Basil, Bishop Eustathius of Sebaste, to root out the Arian heresy in that diocese, where it had taken deep root. Without displaying any literary activity, he took his stand beside his brothers Basil and Gregory in their fight against the Arian heresy. In his life and episcopal administration he displayed the same characteristics as Basil, and Gregory of Nyssa writes of Peter: "In his later life he seemed to be no less than Basil the Great in virtue." Linked together in the closest manner with his brothers, he followed their writings with the greatest interest. At his advice Gregory of Nyssa wrote his great work, Against Eunomius, in defense of Basil's similarly named book answering the polemical work of Eunomius. It was also at his desire that Gregory wrote the Treatise on the Work of the Six Days, to defend Basil's similar treatise against false interpretations of the Book of Genesis and to complete it. Another work of Gregory's, On the Endowment of Man, was also written at Peter's suggestion and sent to the latter with an appropriate preface as an Easter gift in 387. We have no detailed information concerning his activity as a bishop, except that he was present at the Second Ecumenical Synod of Constantinople in 381. Saint Peter reposed in peace in 391. Theodoret of Cyrus wrote of him: "Among the conspicuous bishops of Asia were the two Gregorys, the one of Nazianzus and the other of Nyssa, the latter the brother and the former the friend and fellow worker of the great Basil. These were foremost champions of piety in Cappadocia; and in front rank with them was Peter, born of the same parents with Basil and Gregory, who though not having received like them a foreign education, like them lived a life of brilliant distinction."